When you meet for the first time. a wooden boat of Turkish handmade design and craftsmanship we call a gulet; it can be rather exciting. 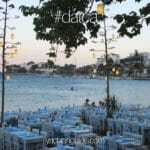 It can also be an overwhelming experience, depending on which gulet you have choosen to hire. All gulets seem to be identical to each other and really the cabins don’t seem to offer all that much in the concept of comfort when you look from the outside. To some (the few) luxury gulet charters might all just look the same. In reality they are all boats, right? Well that’s too simple a description. With many gullets you actually need to go on board one luxury class or higher, to see that the cabins are not as small as it may seem. There can be plenty of ceiling space, tastefully done decor, and roomy layout is surprisingly comfortable for a journey at sea. These beautiful seafaring vessels offer luxury gulet charter holidays to travelers from around the World. Travelers’ expectations vary. So they should. The wonderful part of gulet charters is that these holidays are custom tailored to meet customer requirements as best as possible. Every single charter gulet is a vessel type on its own and that there are no others like it at all. Once aboard, you realize that these gulets were made with special care. The caring comes from all the handwork and man hours put into constructing them. There is no way one could exaggerate about certain gulets. They are what they are and give what there is. Gulets are a tradition that is part of the Turkish culture. Nearly each year new gulets are handcrafted with custom designs – pleasing to the owner. Unique overall, they are mainly built for luxury gulet charters. Luxury gulets are each their own masterpiece. To be aboard a Turkish wooden boat they call a gulet, is a priviledge that a world traveler should at least once in their lifetime, experience. These fine boat are rare as there are just over a thousand worldwide. Gulet charters offer sailing holidays in Turkey that are very different from bareboats. As they are each different from each other so are the sailing experiences that go along with them. 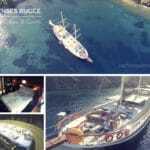 Do Gulet Charters in Turkey Sail? In reality there are gulets without sails too. But that is only because of the owner’s choice, mainly due to lack of funds to be fully equipped to sail. Otherwise gulets are mainly constructed with 2 masts and 4 sails. You may see some that have 3 masts and more sails. Again this is based on the owner, but also the architectural design overall. If you are seeking Turkish gulet sailing holidays, be specific on the sailing part. Let you agent know your expectations; otherwise you will be offered gulets that will provide 2, possibly 3 days of sailing for a few hours each day. 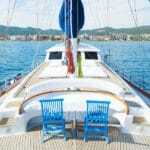 Luxury gulet sailing charter : Barcelona Explorer – Beautiful! 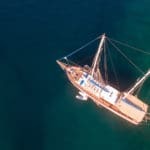 Find out more on luxury gulet charter Turkey holidays and feel the unique experiences they aim to offer during your yacht charter holidays this season. With over 500 charter gulets available, there is bound to be a gulet boat that is suitable to your taste, comfort, and budget.